Go to the Apple //c. The Apple ][+ was my family's first "real" (meaning not a video game console) computer. I remember being intrigued when Dad first brought it home in the early 1980s (1981, I think) when we were living in Huntsville, Alabama. He got it with an extra 16k-bytes of RAM (up to 64k from the 48k default) and a Sanyo DM 5112CX "green-screen" monochrome monitor. It also has an M&R Enterprises SUP'R'MOD II, which is a UHF TV channel 33 output adapter that I don't ever remember using, and an EnhanceWare "LCA-2" lower case enhancement which replaced the original video character ROM. On the outside of the case are a few more options that were added very shortly after getting the machine. On the left, a Kensington Microware System Saver is mounted over the cooling slots which pulls cool air through the system while it's on. Doing double-duty, it also acts as a surge supressor and power strip for the machine and an accessory such as the monitor. On the right is a Versa Computing "EZ-Port" to place the joystick/paddle port in a convenient location. For use with this port we have two analog devices, a TG Products Joystick with trim adjustments and 2 buttons, and a pair of Apple ][ "Hand Controller" paddles (A2M0007). This little printer got lots of use with Magic Windows, the first word processor I ever used. I typed up a paper in middle school (1986) about the ancient egyptians and printed out numerous drafts on it. My mother used it a fair amount, too, for various things. It uses thermal paper on a roll and you simply tear it off when it finished printing. If it's more than one page then it's time for scissors or a paper cutter! Because it simply passes a dot-matrix heating element over the paper to make the "ink appear", it's very quiet. This was the first color dot-matrix printer I ever used. It uses tractor or friction-fed paper and either a color or black ribbon. To get color out of the color ribbon which has different stripes of the 3 primary colors and black, it moves the ribbon up and down on the print head. Needless to say, if it needs to mix colors, it has to make multiple passes across the page for each line. What was really nice about the 32k RAM expansion was that you could send an entire document (they were small in those days) over the Super Serial card to the printer where it would be stored until it could be printed. The computer itself could then go back to working with me, since in those days, processors weren't fast enough and the operating systems weren't powerful enough to do two tasks at once. This is the earliest form of "background printing" that I can remember. The ImageWriter II printed tons of color cards and signs courtesy of the Print Shop. After going to a summer computer camp and using my first color monitor (which also happened to be an Amdek Color I), I discovered what I had been missing from the Apple ][+! I begged Dad to get one, and he finally did. (My folks probably regretted sending me to that computer camp after that! They should be happy I wasn't begging for Topo, a robot that I used at camp that could be programmed through Logo, one of my favorite Apple languages!) Because the monitor is simply NTSC composite, I currently have it hooked up to a VCR in my bedroom for use as a TV. This is used for loading "Integer Basic", which wasn't the default Applesoft Basic which was in ROM on the ][+. I believe it's also necessary for other languages such as Pascal, which my high school was still using on Apple IIe in 1992! Don't laugh too hard...after all, that was the way I finally understood C pointers. This card provided the ][+ with a serial port at up to 9600 baud (Woo-hoo!) for use with the ImageWriter series of printers or a modem, for instance. This is the first sound card I ever used. At the time, my programming knowledge wasn't great enough to actually do anything more than play games and use the card as a speech synthesizer with the demo programs that came with it. This is the little card that makes the pair of 5 and 1/4 inch full height floppy drives go! Without it and the drives, we would have been stuck using the built-in cassette interface. Apple Panic - One of the first games I had for the Apple II+, a classic reminiscent of Lode Runner. Print Shop - The original card/poster/banner publishing tool. This package got tons of use. Choplifter! - A great arcade game where you pilot a helicopter and save refugees. FaceMaker - A younger kids' game, similar to Mr. Potato Head, but with animation. Alphabet Zoo - Another younger kids' game used to learn about the alphabet - lots of mazes. Story Machine - This was a great game where you could type out a story, and the characters you create enact it like a play! Snooper Troops - Another really cool mystery game. Sargon ][ - "The Computer Chess Program"
T.rex - This was an awesome Tyrannosaurus Rex dinosaur simulation game. Zork II - A classic text adventure game. Master Type - "The Typing Instruction Game" - this game sure gave me a head start on learning how to type! Rocky's Boots - This is probably one of the best educational games I've ever used. It played a role in why I'm working for computer processor design companies now, yet I was playing it when I was only 8 or 9 years old. If you want to know what electrical engineers do when it comes to logic design/computer chips, then this is a game for you! I feel that the follow-up to this is Robot Odyssey (also by The Learning Company), which I have for my Tandy Color Computer 2. I've learned that it was actually available for the Apple ][ series and PCs as well as the Tandy Color Computer. Both are available as disk images at Ben Sokal's page or Thomas Foote's page. Arcademic Skill Builders in Math - Dragon Mix - A math tutor arcade game. The Menu ][ - A recipe-type database handler. Microbe - "The Anatomical Adventure" - This is an "Incredible Journey" (a.k.a. Issac Asimov) game in which you're shrunk to microscopic size and injected into a sick patient. This is the only game I have which makes use of the MockingBoard. DOS 3.3 Basics and System Master - Remember when the whole operating system could fit on one side of a floppy and was centered around a programming language, such as BASIC? This Apple II+ is the first computer I ever learned how to program on, and I owe much of my abilities today to having learned how to program while young. LOGO - Logo saw almost as much use as BASIC. It's another programming language which is highly procedural and graphics oriented. MicroZine - This was a subscription that my folks got me with periodic updates of various adventure games, programming tutorials and languages, and more. DataMost's Kids & the Apple - A combination of this book and my Dad are what really got me programming in BASIC. Learning Logo - The manual that taught me Logo. Various Apple Manuals - I used all these for reference to DOS/BASIC/Logo, but they were too tough to learn from for a 2nd or 3rd grader. Apple II Beginner's Guide - great technical info and links. Apple II Programming - a wealth of information on programming and the Apple II. Apple II Emulators - a full listing of a number of emulators. 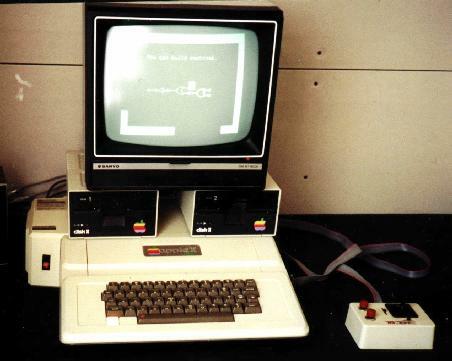 Apple II Emulation Page - more info on emulators and how to get disk images, etc. Trenco Apple II FTP Archive - tons of software! Clairemont High School - still uses their Apples and is a big advocates. Apple II WWW and FTP Sites - this site has not been updated in quite some time, so a number of links are broken, but those that are still around are quite useful.